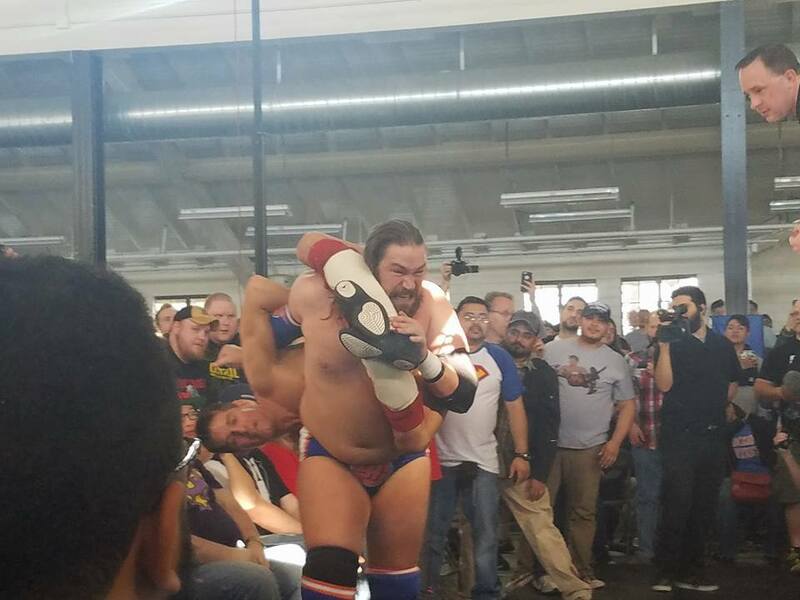 Here we are, Chris Hero’s final day on the independents. The mood inside the gym was joyful, but melancholy at the same time. 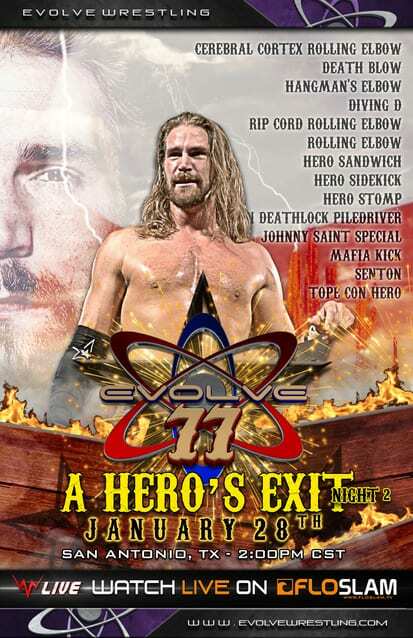 I cannot think of a better send off then having Chris wrestle his most recent nemesis, Zack Sabre Jr.. Also, Evolve has a lot to make up for with all the ring mishaps that occurred the night prior. The ropes breaking three times must have been super embarrassing for the Evolve owners. 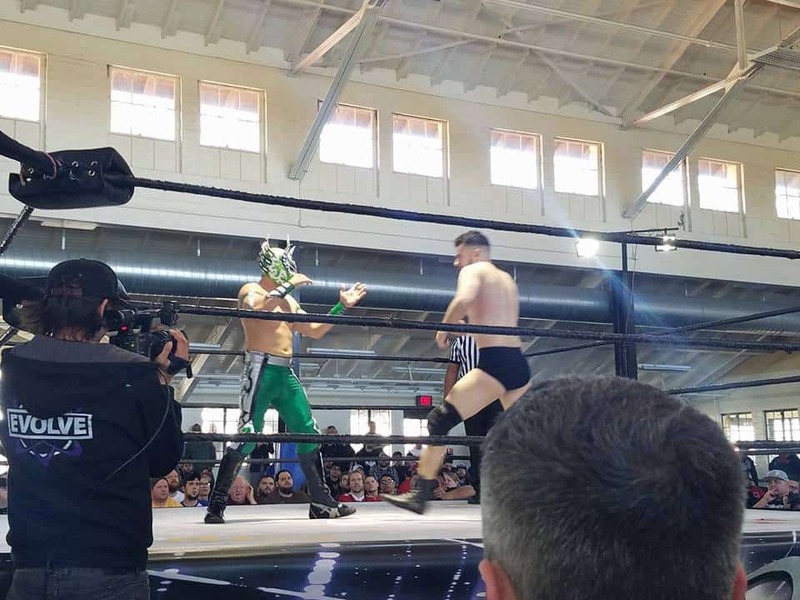 The match was originally to be Darby Allin vs Barrett Brown. Before the match started however, Ethan Page came out, and distracted them while the Gatekeepers jumped Darby. For good measure, Ethan laid out Barrett for complaining they were taking his opportunity. Ethan initially offered the downed men a tag match with the Gatekeepers, but Darby being the crazy man he is insisted on a handicap match. To no ones surprise, Ethan accepted and it was off to the races. Allin was like a rabid dog taking down the two big men, but was quickly overwhelmed by them. At first, I was wondering what these guys could do, but I quickly learned how agile Blaster was. He did a beautiful sommersault tope over the top ropes. No 6’7” man should be able to do that. Darby was getting beat up pretty good, that is until a enraged Zack Sabre Jr. came out to even the odds. At this point, all hell broke loose. The fight spilled out all over the gym. Then, Darby did one of the craziest things I have ever seen in my life. In less then five seconds, he climbed a steel support beam, and jumped off back first onto everyone. Eventually, ZSJ got the win for the team when he submitted Blaster with a Kimura. Although I’ve never heard of Laredo Kid, the crowd gave him a big pop. 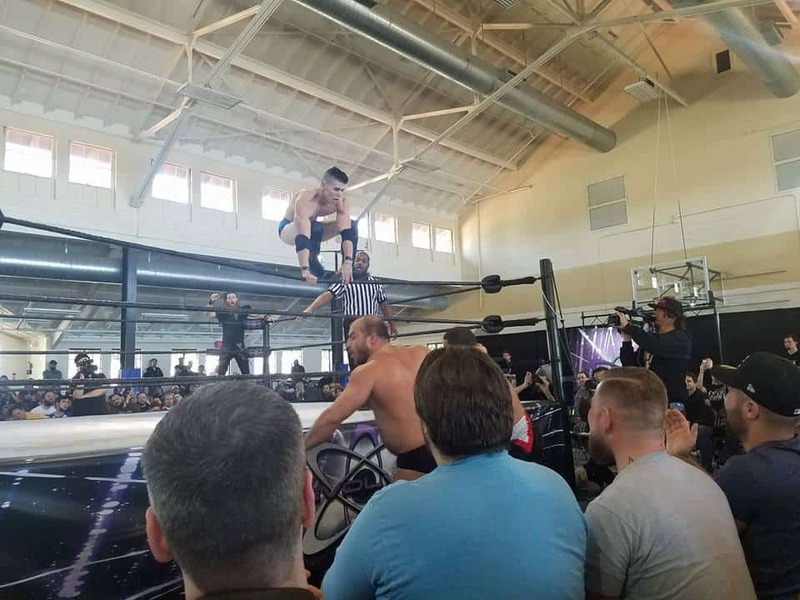 This was just the classic story of the technician trying to ground the high flyer. It reminded me of the classic Dean Malenko WCW cruiserweight matches. Williams did a great job catching, and countering, Laredo Kid’s aerial moves. Williams ended the match with a sick forearm, followed up by a crossface. This was my first time seeing Sammy Guevara wrestle, but he is a well known wrestler in central Texas. The crowd went absolute bonkers for this kid. This was another case of styles clashing. Sammy and Jason used their speed and agility to counter the brawling style of Chris and Jaka. Sammy showed some great high flying offense, but was quickly shut down by Catchpoint. For a good portion of the match, they were beating the breaks off of Sammy. Once tagged in, Kincaid quickly turned the tide. He landed a nice coast to coast kick after he had walked on the ropes. Additionally, Sammy hit a beautiful shooting star press, and an insane 630 splash. However, Sammy and Kincaid tried one to many high risk moves, which costed them the match. This was another match for ACH to show that he isn’t just an aerial artist, but a terrific all around performer. 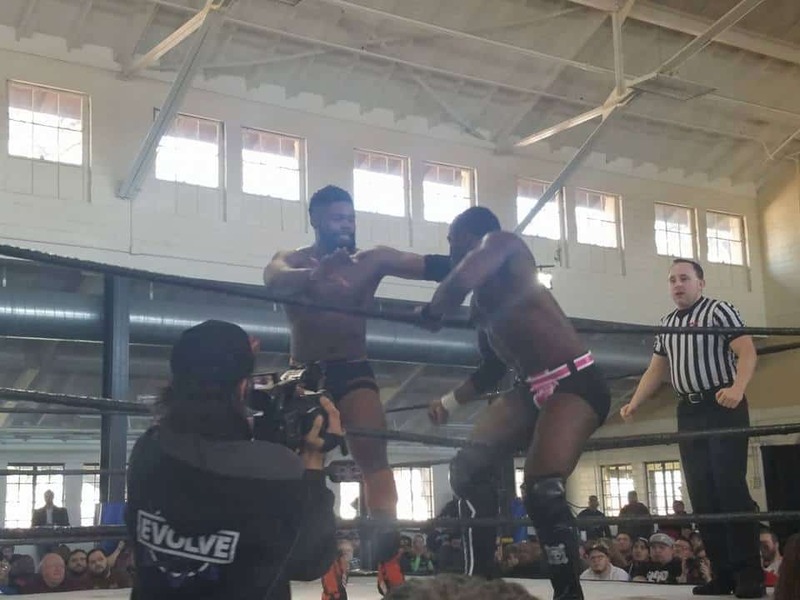 For the first half of the match, ACH was going toe to toe with Yehi. That’s saying a lot considering Yehi is, pound for pound, one of the toughest guys on the Evolve roster. Again, ACH showed a level of aggression that I’ve never seen from him. Near the end of the match, they stood in front of each other, and started trading shots and slaps. It was like I was watching an exchange between Katsuyori Shibata and Tomohiro Ishii. To everyone’s astonishment, ACH won out of nowhere with a roll up pin. I loved the main event, but this match was my match of the night. Riddle and DUSTIN took the no DQ rules to heart. This was not a wrestling match, this was a straight up war. Riddle came out the curtains pouncing on DUSTIN. You could tell he wanted revenge for DUSTIN blindsiding him the night before with a chair. 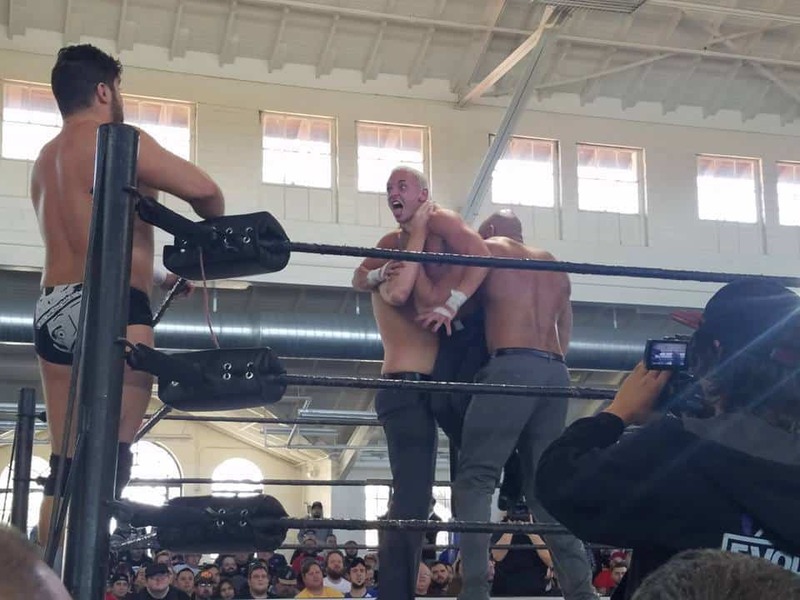 Soon after that, they went to the outside, and DUSTIN started throwing Riddle into the crowd’s chairs multiple times. 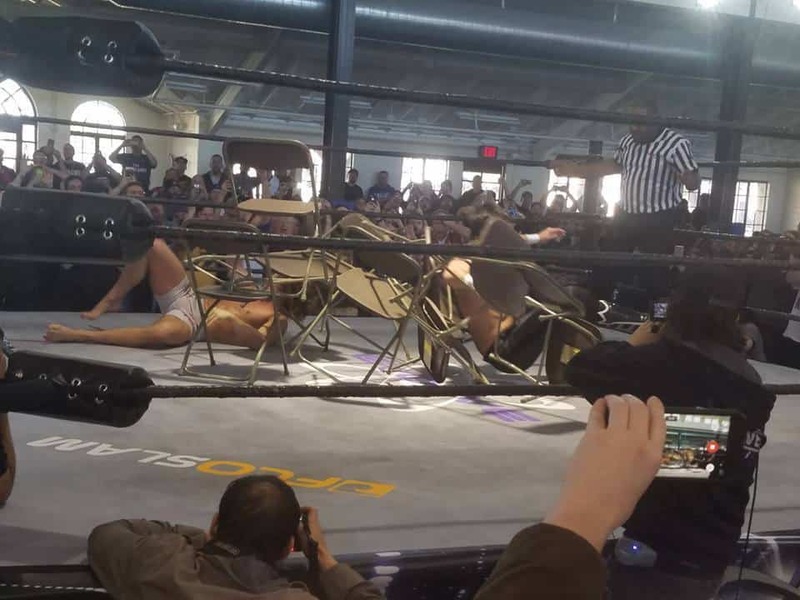 Somehow, Riddle came back, and started hitting DUSTIN with the hard plastic chairs. After a good back and forth, they walked passed me to the merch table. They got on top, and DUSTIN suplexed Riddle on the unforgiving plastic table. When DUSTIN stood up he screamed, “You’re breaking my merch!”, which made me laugh hard. DUSTIN landed a crazy, over the rope dive on top of Riddle while he was laying on a table. The icing on the cake was when Riddle suplexed DUSTIN on top of a pyramid of 10 chairs, which was finally enough to put DUSTIN away. I am a huge fan of Jeff Cobb. In my opinion, he is a modern day Taz. He wrestles a really physical style that incorporates a ton of suplexes. This was, by far, the worst match I have ever seen of his. All the hype and buzz the crowd had from the previous match was destroyed by this one. I don’t blame Cobb though, this snore fest is on Thatcher’s feet. This match gave me chills. Hearing Chris Hero’s theme for the last time made a little bit emotional, and the crowd was going absolutely insane for Hero’s entrance. He had a fun exchange with the crowd prior to the match like he normally does. When that ended, Hero went to shake Sabre’s hand, but was quickly caught in a submission. This showed us that Sabre was not here for jokes and games; he came to finally win. When they went to the outside, Sabre ran around the ring, and landed a vicious forearm uppercut. It would have made Cesaro proud. By this point, they were going back and forth. Hero was using his size to bully Sabre around, while Sabre was landing his kicks, and going for submissions. One of my favorite moments of the match saw Hero walking around with Sabre on top of him, and he slammed him on the chairs right in front of me. It caught me off guard. I also loved when Hero hit a pedigree on Sabre. We went crazy when Hero hit it. Hero’s arrogance was his downfall, as he was caught in a sick submission for the loss. Overall Thoughts: 8.5 Out of 10 This was a better event compared to the night prior. From top to the bottom, this was probably my favorite wrestling show of the weekend. If you take out that terrible Evolve championship match, this would have been one of the top PPV events I have seen in the last year or so. It was an honor and a privilege to see Hero’s final match. I am excited to see what Evolve does from here with Matt Riddle, Zack Sabre Jr, and Jeff Cobb.